Saw that he has just passed away. I used to love his cartoons, and would copy them when I was a schoolboy with a talent for drawing (which has sadly now left me). A troubled soul since his son was so needlessly left for dead in an attack in Kilmarnock years ago. Apologies for my ignorance but is this the same chap that did a cartoon page in one of the papers (possibly The Record)? If so I always remember a really good one he did of Super the day/week after he returned and scored the overhead kick against Hibs. 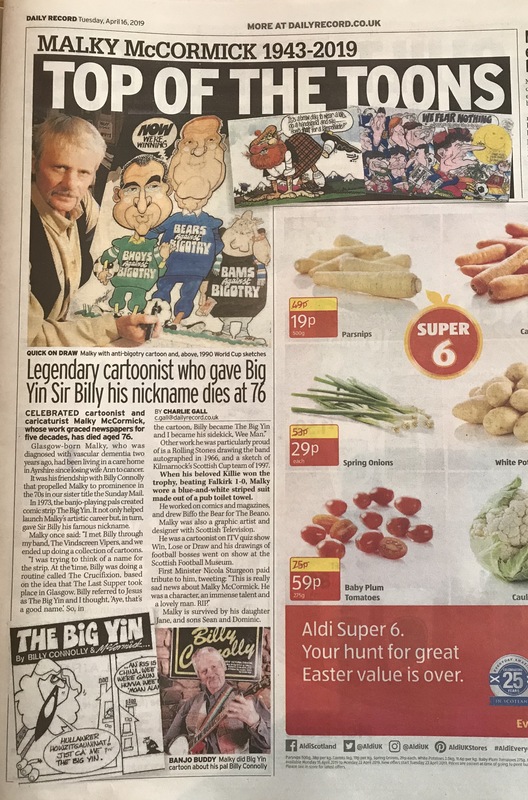 Still got the "The Big Yin" book that contains around 50-60 of his cartoons on Billy Connolly. 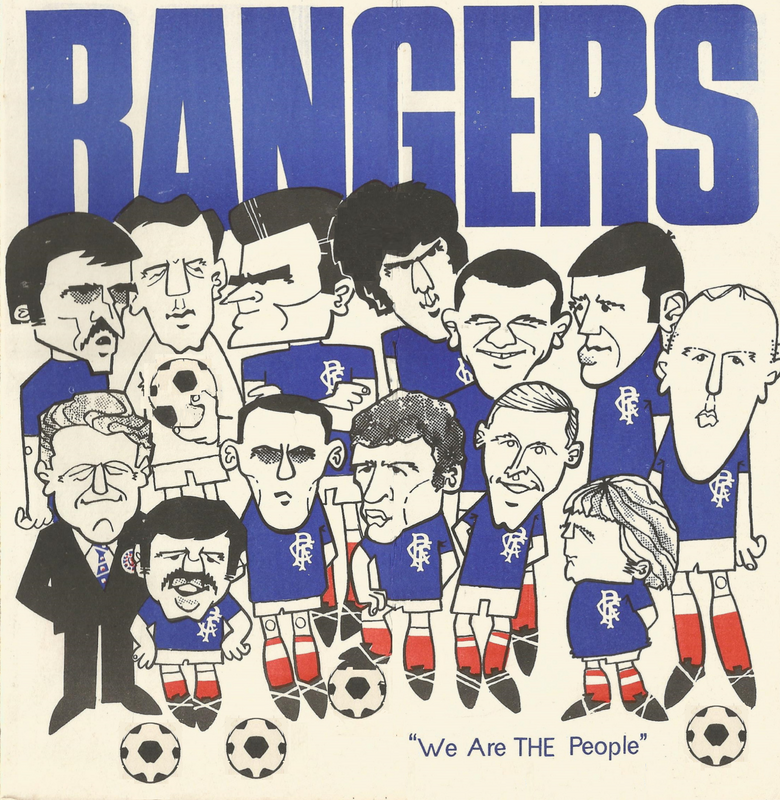 Remember them well plus the Big Yin then was always sporting a Jags rosette. That’s the guy. He also did little bits in the Sun just a few years ago. I remember his Big Yin cartoon in the Sunday Mail. As you say, a troubled soul who attracted some nasty headlines later on in life. He'll be a sad miss. I remember walking through the underpass in Kilmarnock and always stopping to look at his mural for Kilmarnock winning the cup in 1997. Made me so sad when people defaced it and then eventually it was covered over. When I was young I won a competition and Malky was the judge. I had my picture with him in the local paper and he was absolute gent, I was very starstruck! He was a very shy and diminutive fella. Did he always have a wee knob hidden in his cartoons or was it just an urban myth? I'm sure we used to sit and try and spot them back in the day. Could be true. I looked at the cartoon in post #1 and found one. He always seemed to mention Lord Lucan iirc. One I remember was the morning after we had beaten Bayern Munich in the ECWC semi in 1972 and the Tarriers lost to Inter Milan in a penalty shoot out with Dixie Deans skying one over the bar. "Tell Dixie we've found the ball." I knew Sean (his son) when I was younger. What happened was a tragedy and appeared to destroy the family. I only met him once as and he seemed a gent. My sister won a competition and had one of his pictures on her bedroom wall growing up that he did for her. Also got the book somewhere, seem to remember a character called Bad-yin Mc Fadyin who was a Dare Devil Corpy bus driver IIRC. Used to know his young brother when I lived in Clarkston many, many moons ago. I remember him getting arrested for some student prank involving scaffolding in George Sq. in support of Scottish independence. Getting back to Malky, that was an utter travesty that happened to his son and subsequently he and his wife. Loved looking at his cartoons in the paper when I was young growing up in the 90s. I remember his Big Yin cartoon in the Sunday Mail. That’s what I remember, in particular one episode where the Big Yin is in an Aberdeen boozer by himself when he needs a slash. Think he used to live on the way to Galston and had painted his house in the style of his cartoons. I remember he always quoted "Are You Still Lucan For Me?" I remember the Lord Lucan references from seeing his work when I was a kid. I used to copy his style in drawing footballers. It’s all stuff of an age. He also used to do the old 'Fritz a grand old team' skit any time any khont played a German team. Where could I get a copy of these ? My father was quite close pals with him way back and remember meeting him and his wife at their family home come studio in Waterside (pretty sure it was a converted sawmill) and he had quite the perfect set-up there. Both him and his wife were lovely to talk to - he came across as shy but with that larger than life side to him that you saw in his work. He was a very talented artist - the cartoons were just part of his skills. He did an impromptu caricature of the whole lot of us as a family and I remember it took pride of place in my father's work reception for many a year. What happened to his boy? I know Malky was a big killie fan and remember the underpass he painted after their Scottish cup win. 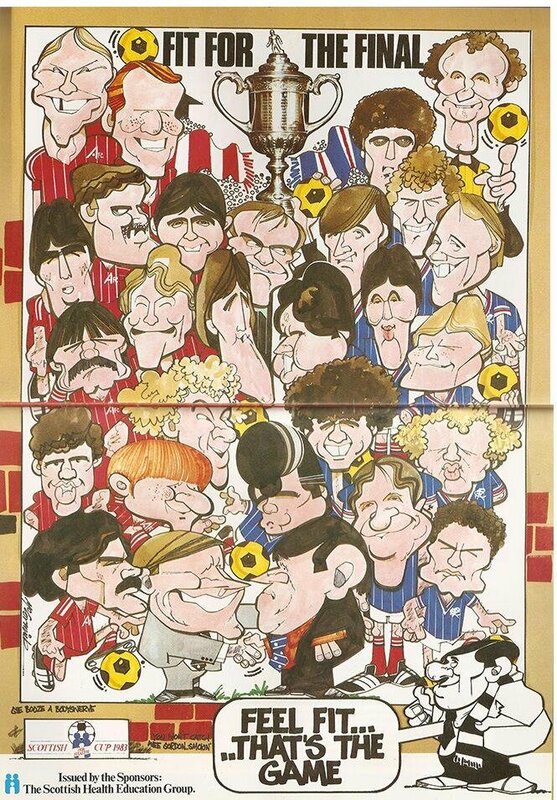 I had a place mat with his caricature for the 1984 league cup final ("..Battle fever on..", "...fancy us strongly. ", Ally hat-trick day). It had John McClelland and Danny McGrain shaking hands on the centre circle at Hamdump with all sorts going on round about them. Can't find the image on the internet....yet! I recall he did a Hogmannay gig on the Beeb where he actually sang a jocular song which mentioned the Bombay Orange band playing We'll Guard Old Delhi's Walls - imagine trying that in today's hate-infected atmosphere. Back in 2004 one of his sons was attacked by 3 guys in John Finnie Street in Kilmarnock and sustained a serious brain injury as a result. The sentences given to the people concerned were very light and I don't think Malky could come to terms with what took place. I used to deliver his milk as a lad back in the 90s as his house in Waterside. However in recent years anytime I drove past him he always seemed a bit worse for wear which was a shame. As others have said it looks like he hit the bottle quite hard. Malky was a rare top artist. His pics were instantly recognisable for detail and humour. Jaws, DJ, Sandy, Calimero ,Stewart Kennedy and Ham n Egg. Middle left I'm strugglin wi. He did a caricature of my son and his wife for a wedding present a few years ago. Only ever talked to him on the phone but he came across as a lovely guy. Yes, PC Owen Yirway haha brilliant. 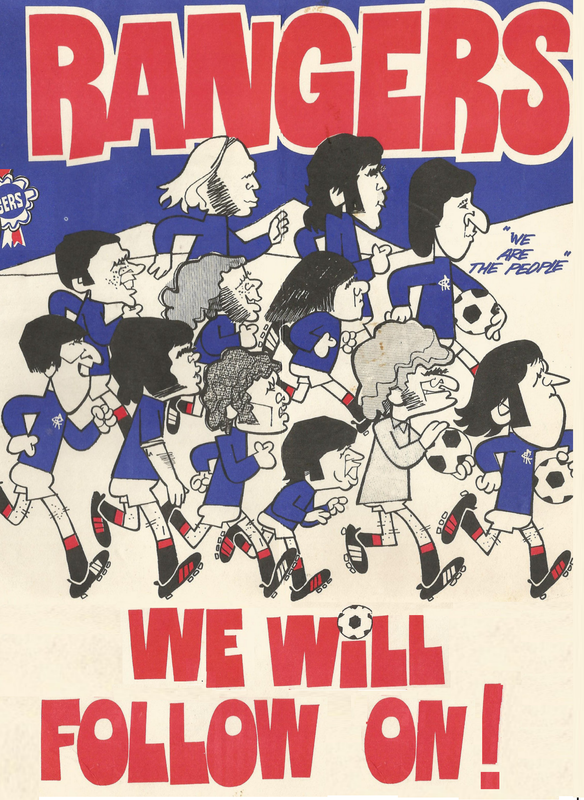 That was actually by Rod the Daily Record cartoonist of the day, not Malky McCormick. I think it was the Sunday Mail after the Sinatra concert at Ibrox there was a cartoon of Sinatra in tuxedo singing 'The Sash My Godfather Wore'. I posted about this guy (without knowing who he was) a year or so ago! I had a 1986? print of big Terry Butcher and a much smaller Celtic player. Aitken? or McGrain (who didn't feature in the starting 11) and I was looking for a print. 1986 Skol cup final. 2-1 to the Gers. It was on my wall from 6 to 16 when I moved out. This is the first thing I've ever seen in that style and I'd be 90% certain it's the same artist.